For more information about these and other tax scams visit the IRS Web site at http://www.irs.gov. Remember that for the genuine IRS Web site be sure to use .gov. Don’t be confused by internet sites that end in .com, .net, .org or other designations instead of .gov. 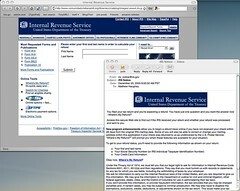 The address of the official IRS governmental Web site is http://www.irs.gov. This entry was posted in *AskTaxMama Newsletter, Fraud, IRS News, Phishing, scams and tagged 800-829-1040, Business/Finance, Employer Identification Number, Fraud, Government, Income tax in the United States, Internal Revenue Service, Phishing, return preparation services, tax law, Tax preparation, tax preparer, Tax resistance, Tax return, Tax Scams, Taxation in the United States.